Located on a beautiful manicured double canal lot, youll find all the luxury and space you have been looking for, all within this all-custom-built pool home. 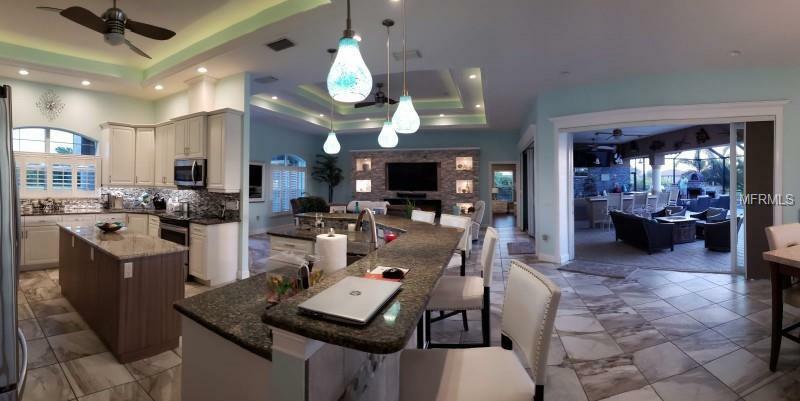 This stunning home offers a huge great room with coffered ceilings, custom entertainment wall, spacious dining room and an open kitchen with island, coffered ceiling and granite counter tops. Also, uniquely equipped with a walk-in pantry and dual refrigerators. The open floor plan, custom built outdoor bar and outdoor fireplace with wood fired pizza oven, plus a sound system throughout the interior and exterior are perfect for entertaining and enjoying the beautiful outdoors. The large Master Suite features double walk-in closets, tray ceiling, access to a private office and pool and a unique bathroom with his and her separated sinks and a double entry Roman shower with his and her shower heads. The Master Bath features a jacuzzi tub that has music and lights under water. This home also has a private Jack & Jill bathroom between bedrooms 3 & 4 along with an outdoor pool/bar bathroom. The Guest Suite features a walk-in closet and slider doors directly to the pool area. The oversized 4 car garage with custom cabinets can accommodate larger or multiple vehicles. This home also includes hurricane impact glass throughout, a canal fed irrigation system, electric pool heater, camera system, outdoor sundeck, oversized lanai spanning nearly the width of the entire home with 4 large seating areas for perfect outdoor entertainment. This home has it all!